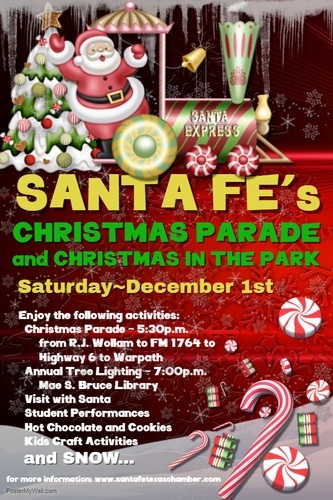 This event is a combined effort between the City of Santa Fe, the Santa Fe Chamber of Commerce, Inc. and the City of Santa Fe Parks Board. The Christmas Parade will start promptly at 5:30p and run from R.J. Wollom Elementary School along FM 1764 to Highway 6 to Warpath Drive. Santa Claus is ALWAYS our Grand Marshall and will be available after the parade in Mae S. Bruce Library for the Little's to sit with and share their Christmas wishes. Parade Entries are $15 and are donated by the Chamber of Commerce to H.I.S. Ministries Bucks for Bikes Program.